Home/curriculum/What is a broad and balanced curriculum? Historically, the curriculum schools have taught hasn’t really mattered that much. Then, when the National Curriculum was introduced in the late 1980s, committees of experts had made all the decisions for us. As more and more schools have academised and won free of the strictures of the National Curriculum, you might have expected a flowering of thought about how best to structure and select what children should be taught, but far more effort has been expended on the how of education. This may, in part, be due to Ofsted’s long preoccupation with judging the quality of teaching and learning provided by schools. This is, happily I think, set to change. New chief inspector, Amanda Spielman has said that, “One of the areas that I think we sometimes lose sight of is the real substance of education. Not the exam grades or the progress scores, important though they are, but instead the real meat of what is taught in our schools and colleges: the curriculum.” Needless to say, with Ofsted’s increasing focus on the curriculum, schools will soon, if they haven’t already, be panicking about precisely what inspectors hope to see. The domain is everything it’s possible to know about a subject. For obvious reasons, exam boards pick aspects of this domain on which their courses will focus. This necessarily narrows the curriculum and, to some extent, GCSE and A Level specifications will exert an inevitable influence over curriculum decisions. The examination then narrows the focus further to what is possible for a pupil to demonstrate in about 2 hours. A good examination will carefully sample as widely as possible from what’s covered by the specification, but exam boards have, in an effort to paint themselves as being as easy for pupils to do well in as they possibly can, gone to enormous efforts to give schools as narrow a range of possibilities on which to focus in classrooms. This is a rational approach to what are perceived to be the levers of accountability, but it creates the perverse incentive for schools to squeeze the curriculum into 5 years worth of exam practice. No one could reasonably argue that this could ever represent a broad and balanced curriculum. As Spielman notes, “I have seen GCSE assessment objectives tracking back into Year 7, and SAT practice papers starting in Year 4. And I’ve seen lessons where everything is about the exam and where teaching the mark schemes has a bigger place than teaching history.” Whilst this might, arguably, be a sensible approach to maximise pupils’ performance in national exams, it’s surely no one’s idea of a desirable model of public education. …if you are leading a school that enters 90% of young people for the European Computer Driving Licence – a qualification that can take only 2 days to study for – then you must ask yourself whether you care more about the school’s interests than about making the most of pupils’ limited time at school. If you don’t encourage EAL (English as an additional language) students to take a taught language at GCSE because they can tick that box with a home language GCSE instead, then you are limiting their education. Again, if you are putting more resources into providing exam scribes than in teaching your strugglers to read and write, or scrapping most of your curriculum through Year 6 to focus just on English and maths. If you are doing any of those things then you are probably doing most of your students a disservice. If your school is not bound by the National Curriculum, is your alternative at least as good? Are pupils taught content some of what they might reasonably be expected to encounter in other contexts, or is school the only place they’re likely to encounter it? Does your curriculum enable pupils to offer informed critique of establishment views of what is considered culturally valuable? Is there something you have not included in your curriculum that you consider important or interesting? Is there anything you could replace to make sure you’re teaching what you value? Is the curriculum you’re offering the one you’d want your own children to experience? Hirsch makes a convincing case in his book ‘Why Knowledge Matters’ for the importance of a prescriptive knowledge-rich curriculum from primary through secondary school. It is something countries doing well in international educational benchmarks have and something that countries doing poorly lack. It makes so much sense to have a common curriculum – shared resources, shared expertise on how to teach topics and transfer-ability between schools. Here in New Zealand only maths has managed to keep specific knowledge listed in the curriculum, the rest have vague statements giving huge latitude to teachers to choose topics and subject content until students reach secondary school when national exam specifications start to make their presence felt. I’ve yet to meet a teacher that does not believe knowledge matters but that does not make Hirsch correct in the plugging of knowledge rich (or, as some would interpret his work, knowledge only). A balanced curriculum should demonstrate exactly that to which it aspires … balance. Knowledge, skills, mastery, heutogogy, critical thinking, amongst other themes. Isn’t that a point about structure. As I understand Hirsch’s approach is to emphasis knowledge in planning, allowing critical thinking and problem solving skills (he may not use that term) to naturally emerge from the mastery of content and the interplay between large numbers of students having a shared cultural base. Heutogogy and meta-cognition would then hopefully emerge with little dedicated time being set aside to develop them. Well said, David. We have been rewriting our curriculum (incorporating interleaving & retrieval/practice) and placing more emphasis on broadening knowledge and already we are seeing children’s reading understanding improve, as well as more general enthusiasm about our world. 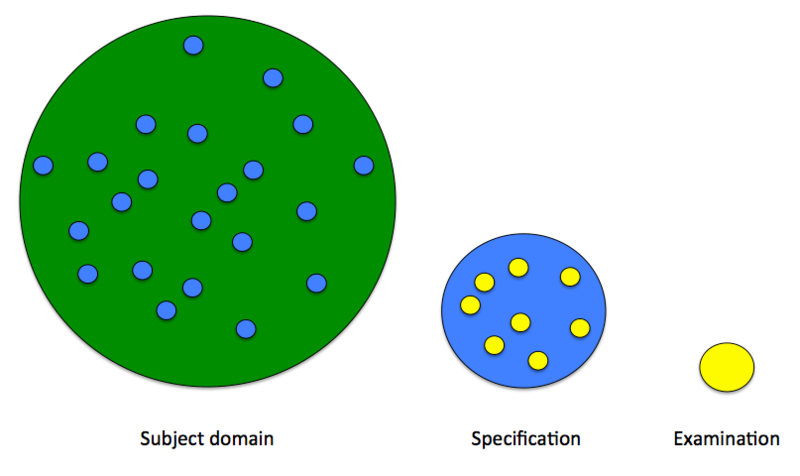 I agree with much of what you say and I like your graphic about domain, specification and exam. Therefore, I am intrigued as to why you say starting GCSE courses in Year 9 is not, in your view, a broad and balanced curriculum. If pupils have the national curriculum in Year 7 and Year 8 as well as from pre-school to Year 6 they will have had 8 or more years of a wide curriculum. By that age, pupils and their parents know what they like and where their skills lie, whether they could choose art, music, drama, dance, triple science, two languages, ancient history, latin etc. By giving pupils the opportunity to choose their subjects at the end of 8 years of national curriculum we give them and their specialist GCSE teachers the chance to open up the full domain of their preferred subjects. I want pupils to be able to fall in love with their subjects not just know the specification. I want pupils to have time to make mistakes, grapple with difficult concepts in their beloved subjects and expand their knowledge and interests in subjects way beyond the specification. By giving pupils the chance to opt for their preferred subjects at the end of year 8 with enough variety to keep their options open in the future we can help pupils to see school education as opening up opportunities not passing exams, which is the biggest cause of mental health issues in schools. Furthermore, if we want our pupils to become experts in their field, researchers, university lecturers, international leaders in their field, Nobel prize winners we must give them the time to see their subjects as much more than what the examiners want to see. I would be very interested to hear your view on my points. A GCSE course is, by its very nature, a narrowing of the curriculum. I guess there’s no reason why you couldn’t choose to spend a year of your 3 year KS4 *not* teaching GCSE content but then, why have a 3 year KS4 at all? KS3 is a rich and rare opportunity for children in the English system to get specialist teaching is a broad range of subject. For the most part, this is not possible in KS2 and breadth inevitably narrows when options are selected for KS4. By reducing this opportunity by a whole year, the breadth children can experience is much less.